In the video above, you can see, that we cannot drag and drop a file onto a PowerShell script. 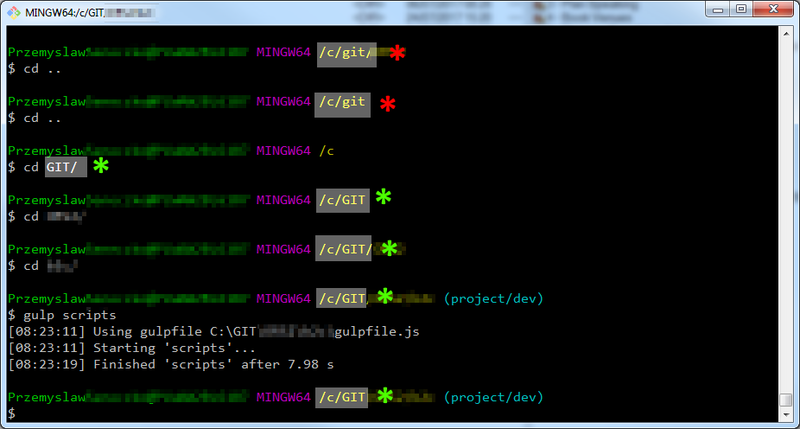 Conversely, we can easily do this with bash script having installed Git for Windows. I needed to perform some trivial conversion within a SQL script, i.e. replace ROLLBACK with COMMIT. I thought I would implement it with PowerShell. I am not going to comment on the implementation itself, even though it turned out to be not that obvious. Then I realized, it would be nice, if I could drag and drop a file in question to apply the conversions on it. This does not work with default configuration of PowerShell. I did not have time to hack it somewhere in the registry, as I assume it is doable. I switched to old, good bash shell instead. It’s a pity I couldn’t do that with Windows native scripting technology. It is very interesting, that MinGW port of shell has been so carefully implemented, that even dragging and dropping works in non-native environment. I recall the book Pragmatic Programmer: From Journeyman To Master. There is a whole subchapter about the power of Unix tools. The conclusion was, that over time we would come across plenty of distinguished file formats and tools to manipulate data stored with them. Some of them may become forgotten and abandoned years later, making it difficult to extract or modify the data. Some may work only on specific platforms. But standard Unix tools like shell scripting, Perl, AWK will always exist. I should say: not only will they always exist, but also they will thrive and support almost every platform you can imagine. They work on plain text, which is easy to process. I am a strong proponent of before-mentioned technologies and I have successfully used them many times in everyday work. It sounds particularly strange among .NET developers, but this what it looks like. The PowerShell simply did not do the trick for me. Perl did. As it always does. Write-Host "Please provide target file"
perl -pi -w -e 's/^ROLLBACK;/COMMIT;/g;' "$1"
This one attacked me yesterday by the end of the day. 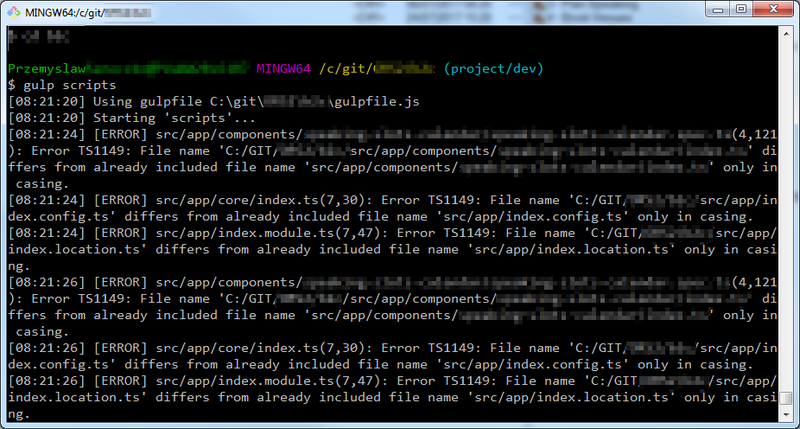 This is a TypeScript project with some instrumentation done with gulp. The command shown attempts to launch TypeScript compiler. The console is standard git bash for Windows. I didn’t realize what was going on there at the first sight. The messages were confusing and mysterious. I made sure I didn’t have any changes in the repository comparing to the HEAD. I opened the folder in Visual Studio Code and everything was fine. It was only the compiler which saw the problems. After changing the directory using names with proper casing everything was fine. What actually happened was that, I somehow opened the git bash providing the current directory name using lower case letters. It is not that difficult to do that. This is a flaw in the MINGW implementation of bash, I think. It just allows you to change the directory using its name written with whatever case. That is not the problem itself, because cmd.exe allows you to do so as well. The problem is that it then stores the path (probably in PWD environment variable). Some cross-platform tools, which are case sensitive on other platforms, when executed from git bash with mismatched working directory casing may begin to treat such path as separate one, different from the original one. Especially tools which process files using their paths relative to the current directory, like TypeScript compiler for instance. This can possibly be a wider class of problems and I guess there are other development tools which behave like that when launched from git bash under before mentioned conditions.